I was nine years old in 1972. I started to watch hockey that year and my favorite team the New York Rangers were in the Stanley Cup Finals against the Boston Bruins. The Rangers lost but it was a great year and if you were a Canadian it was a better year! This card features minor league players, WHA players, and NHL players. Some were stars but many aren’t but that doesn’t mean they weren’t good players because they were. This set has a lot of mega autographs and memorabilia cards in it as you have seen unfolding the past few months. 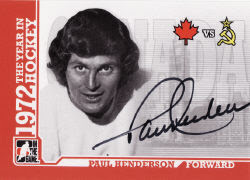 The 1972 Summit Series is the reason this set was born and as memorable as that Canada-Russia eight-game series was an autograph of one of those greats would make my day!